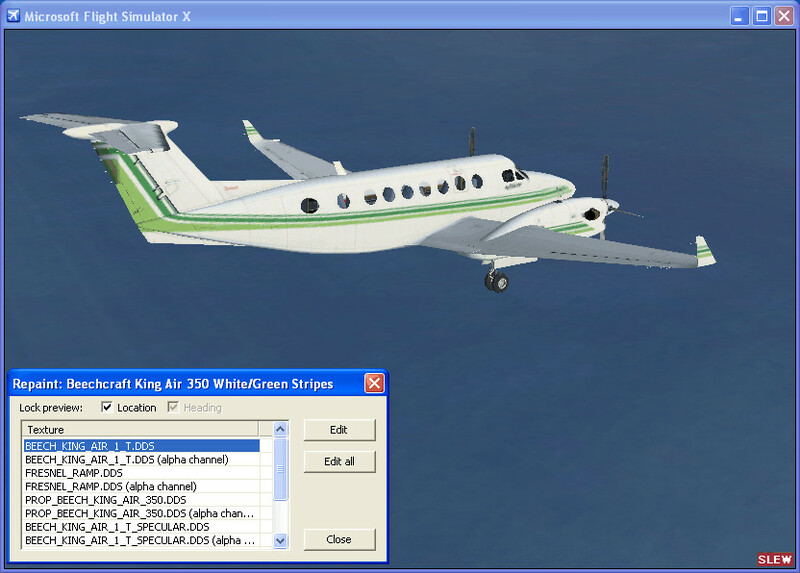 Repaint Wizard is an easy to use tool for painting FSX and FS9 aircraft that lets you view changes live in Flight Simulator. You can easily view paint schemes, create new ones and edit textures with your favorite image editor. Repaint Wizard automatically takes care of texture format conversions. A preview model shown in Flight Simulator displays the textures and updates them every time you hit the save button, allowing you to instantly see the effect of your changes. Repaint Wizard runs as a module inside Flight Simulator and supports all texture types used, including diffuse, specular, bumpmap, reflection, fresnel and night textures. The preview is always 100% accurate, because it appears as an actual aircraft directly in FSX/FS9! To check how your textures appear in specific weather conditions or at a specific time of day, simply set these conditions in FS. With Repaint Wizard, you no longer have to restart Flight Simulator frequently or guess how the textures would look like - you will see the changes immediately after you hit the save button! 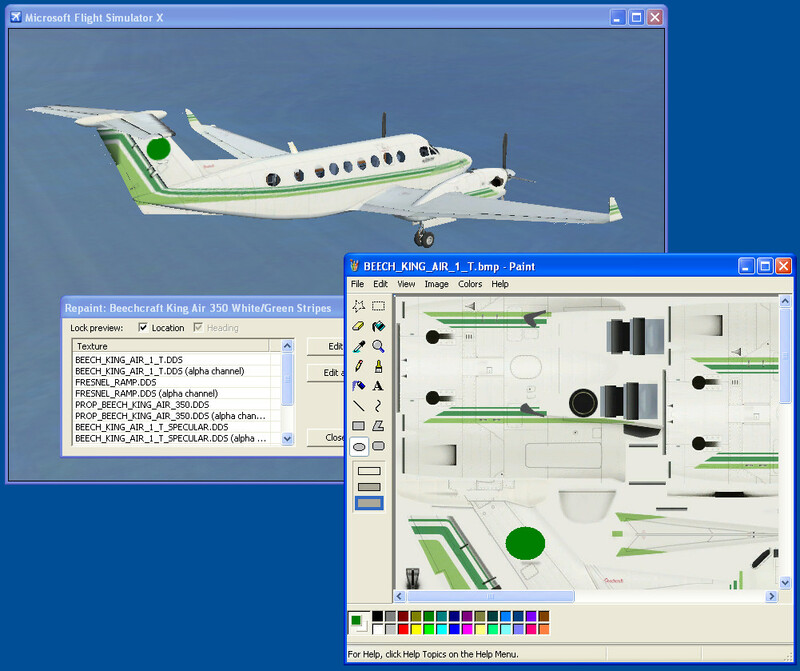 Repaint Wizard is a must have tool both for novice users and expert aircraft painters. For novice users, it will take care of all technical details about texture formats and aircraft configuration files, letting you concentrate on painting. You could have your first repaint done and flying in a couple of minutes! For experts, it allows seeing changes in Flight Simulator almost in real time, which lets you cut down on the development time. Fine tuning texture colors, reflections, bump maps and night textures is a breeze with Repaint Wizard! And if you prefer doing your texture conversions yourself, you can just use it for a speedy preview of your changes. 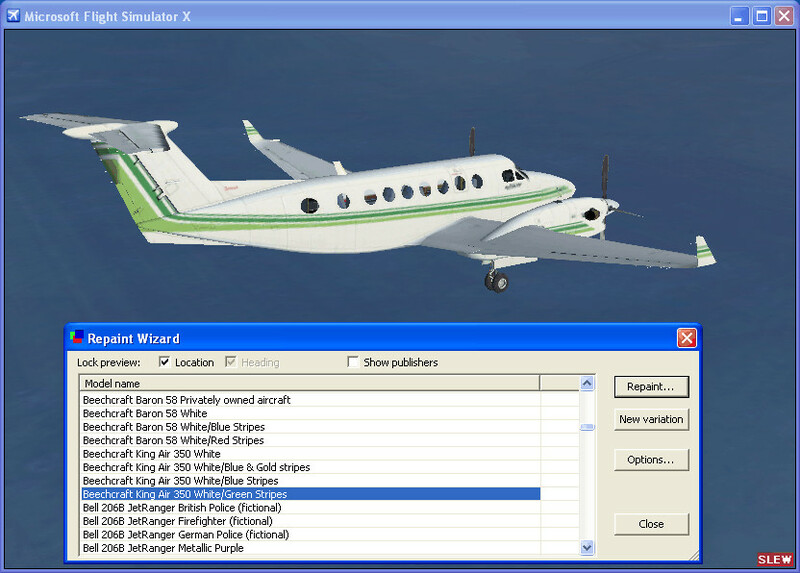 Get Repaint Wizard now - the only repaint tool that works directly inside Flight Simulator! Runs as a module directly in Flight Simulator. Lists all aircraft and paint schemes installed. Simply select a paint scheme and click the repaint button to begin! Lets you easily create copies of existing paint schemes. Displays a preview model in Flight Simulator and immediately updates it every time you save a modified texture. Repaint Wizard is the only tool on the market that has this capability. Automatically converts textures into BMP or TGA formats for use in the image editor. Automatically converts textures back into their original format when you edit and save them. When using the BMP format, stores the alpha channel in a separate file. Displays the most accurate preview possible, because the preview is an actual aircraft displayed by Flight Simulator using your textures. Works with every image editor. You can download Repaint Wizard and try it out for free. In the free demo mode, you can use it to repaint the default Cessna C182S and Boeing 737 aircraft supplied with Flight Simulator.